Bought from the artist by George Price Boyce for his sister Joanna Wells, 23 February 1858 (60 gns). By descent to Mrs Arthur Street, who still had it in 1923. Anonymous sale; Christie's, London, 14 June 2000, lot 11. M. H. Spielmann, Millais and his Works, Edinburgh and London, 1898, p. 169, no. 50. J. G. Millais, The Life and Letters of Sir John Everett Millais, London, 1899, vol. 2, p. 469. M. Bennett, 'A Check List of Pre-Raphaelite Pictures exhibited at Liverpool 1846-67, and some of their Northern Collectors', Burlington Magazine, vol. cv, no. 728, November 1963, p. 492. Millais, exh. Tate Britain, London, 2007-8, cat. p. 134, under no. 83. Possibly Liverpool, Liverpool Academy, 1858, no. 600, as 'Portrait of a Young Lady'. London, Royal Academy, Works by the late Sir John Everett Millais, Bart, Winter 1898, no. 31, as 'Head of a Girl', lent by H.T. Wells, widower of Joanna Boyce. London, South London Art Gallery, 1898, no. 63. Whitechapel, Whitechapel City Art Gallery, British Art of Fifty Years Ago, 1905, no. 408. Manchester, Manchester Art Gallery, Works of Ford Madox Brown and the Pre-Raphaelites, 1911, no. 238. London, Tate Gallery, Paintings and Drawings of the 1860 Period, 1923, no. 88, lent by Mrs Street. The girls were the considerably younger sisters of Millais' wife Effie, who had formerly been married to the critic and champion of the Pre-Raphaelites, John Ruskin. She had married Millais on 3 July 1855 after her previous marriage had been annulled amid much scandalous tittle-tattle and rumour. Sophie and Alice often stayed with their sister and her husband in London, and in the late 1850s were among their brother-in-law's favourite models. Most famously, they appear in his masterpiece Autumn Leaves (fig. 2), exhibited at the Royal Academy in 1856. Sophie stands in the centre of the composition, dropping leaves into a basket which is held by Alice. The picture was painted at Annat Lodge, Perthshire, which Millais and his wife had taken to be near her family home, Bowerswell, and to escape from London until the gossip surrounding their marriage had subsided. There is an obvious relationship between Autumn Leaves and the studies of Sophie and Alice, which were painted only a year or two later and show the sisters' heads in poses that are already anticipated in the great work of 1856. 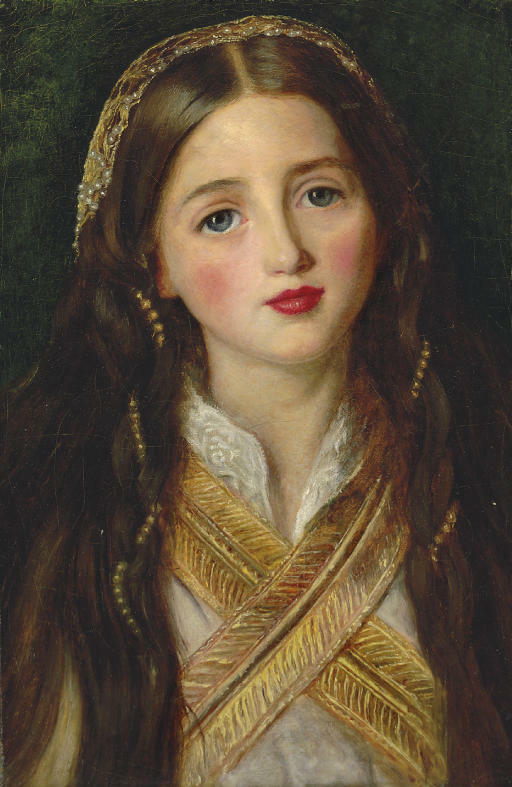 The portrait of Sophie was bought in 1857 by the watercolourist George Price Boyce, an intimate of the Pre-Raphaelite circle as well as an invaluable recorder of their doings in his published diaries. The following year he bought Alice's portrait too, paying Millais the same price (60 guineas) and giving the picture to his sister, Joanna, the wife of the portrait painter Henry Tanworth Wells and herself a talented artist. Boyce was a passionate collector, buying both modern works, often by his Pre-Raphaelite friends, and Old Master paintings. After his death in 1897, his collection took three days to disperse at Christie's. Boyce seems to have been particularly attracted to pictures of half-length female figures. He also acquired examples by Rossetti and Burne-Jones, and both he and Joanna produced some themselves. His most important Rossetti of this type was the Bocca Baciata of 1859 (Museum of Fine Arts, Boston), a seminal work in which the artist at a stroke defined the Aesthetic ideal, using the half-length format to focus attention on the beauty of his model (in this case Fanny Cornforth) and the overall decorative and chromatic effect. He described the picture as having 'a rather Venetian aspect', and we know that he was studying the sort of prototypes that he clearly had in mind. Nor is it surprising that Boyce owned Old Masters of this type. It is fascinating in this context to find Boyce buying Millais' half-length studies of the Gray sisters only a year or two before he commissioned Bocca Baciata. In this sense at least they anticipate Rossetti's masterpiece, and the question arises of to what extent, if any, they influenced the radical concept it enshrines, suggesting not only the general format but the lack of narrative content and the pronounced emphasis on decorative detail. Nor can the subject be divorced from the dependence of the studies on Autumn Leaves, itself a work of crucial significance in relation to Aestheticism, having been conceived, according the Effie Millais, as 'a picture full of beauty without subject'. Clearly there is something here that deserves further analysis, paying equal attention to the contributions of Millais and Rossetti, the taste of G.P.Boyce, and the general vogue in the circle for Venetian painting.